REGINA, May 17, 2017 /CNW/ - Input Capital Corp. ("Input" or the "Company") (TSX Venture: INP) (US: INPCF) has released its results for the second quarter of its 2017 fiscal year. All figures are presented in Canadian dollars. "This was a very successful quarter for Input," said President and CEO Doug Emsley. "During the quarter, Input recorded record gross deployment of $20.563 million and added a record number of new clients, taking our total stream count to 179. This brings gross deployment for the year to date to $33.132 million. A large measure of this success comes as a result of Marketing Streams, a new variation on streaming that targets farmers looking to get better pricing for their canola. We soft-launched Marketing Streams in January and have already signed up over 60 farmers in just the first three months. 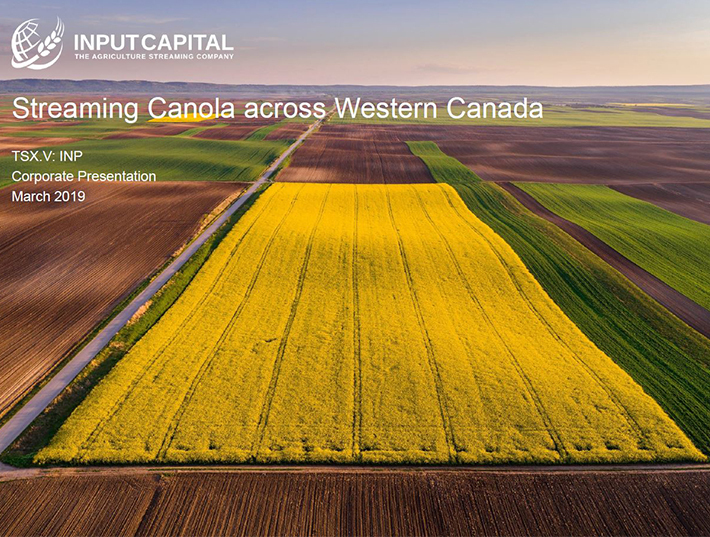 Marketing Streams significantly broaden the addressable market of canola farmers available to Input. "During the quarter, we also sold 18,992 MT of canola bringing our total to 43,950 MT for the year to date in spite of the weather-related delays to harvest activity in October. Canola sales will continue as some over-wintered canola is harvested this spring. In addition, we have made significant progress on long-anticipated farmland sales, completing one sale and announcing a second one. "I would be remiss if I failed to mention that last month, the co-founders of the company, including myself, purchased another 4,250,000 shares of the company at $1.80 per share. This brings insider ownership of Input to over 20% (basic) and over 27% (fully diluted). This demonstrates our confidence in the business of Input and we are excited to continue growing the Company for many years to come with even more skin in the game." Recorded gross capital deployment of $20.563 million in upfront payments. 1 Non-IFRS financial measures with no standardized meaning under IFRS. For further information and a detailed reconciliation, refer to "Non-IFRS Measures" beginning on page 23 of the MD&A. Input completed an update of its revolving credit facility with HSBC Bank Canada. There are no material changes to the agreement, but several changes were made which simplify reporting processes and enhance the Company's ability to draw on the facility as it relates to the second year of Capital Streams as well as the inclusion of Marketing Streams for draw purposes. Recorded gross capital deployment of $33.132 million in upfront payments. Net deployment for accounting purposes was $19.265 million into 140 streaming contracts, adding 69 new producers to the portfolio and more than 193,000 MT to the Company's future canola sales. The difference in upfront payments is attributable to $9.956 million in contracts which remained pending at the end of the quarter due to closing conditions not yet fulfilled, and to $3.911 million in contract restructuring. For the first time, the upfront payment per tonne reflects upfront payments made into Marketing Streams. For more information about Marketing Streams, refer to discussion on Marketing Streams beginning on page 10 in the accompanying Management's Discussion and Analysis. For the quarter ended March 31, 2017, Input generated adjusted sales from streaming contracts of $8.967 million on adjusted streaming volume of 18,992 MT for an average price of $472 per MT. The sales from streaming tonnes plus net settlements of canola interests for the quarter represent a 222% increase in quarterly volume over the comparable quarter one year ago, when the Company sold 5,894 MT of canola equivalent for revenue of $2.633 million for an average price of $447 per MT. For the six months ended March 31, 2017, Input generated adjusted sales from streaming contracts of $20.691 million on the adjusted streaming volume of 43,950 MT an average price of $471 per MT. The sales from streaming tonnes plus net settlements from streaming tonnes for the quarter represent a 16% increase in quarterly volume over the comparable quarter one year ago, when the Company sold 37,783 MT of canola equivalent for revenue of $18.273 million for an average price of $484 per MT. For the three months ended March 31, 2017, Input recorded gross capital deployment of $20.563 million (compared to $11.264 million in the same quarter last year) in upfront payments into 125 streaming contracts for the right to purchase over 175,000 MT of canola over the life of the streaming contracts. Net deployment for accounting purposes was $15.153 million. The difference is attributable to $2.500 million in contracts which remained pending at the end of the quarter due to closing conditions not yet fulfilled, and to $2.910 million in contract restructuring. During the quarter, Input added 60 new producers to its streaming contract portfolio; 40 in Saskatchewan, 19 in Alberta and 1 in Manitoba. The remaining contracts were renewals, expansions and restructures of existing contracts. During the comparable quarter last year, Input added 17 new producers to its portfolio. Input has taken deliberate steps to add a larger number of smaller contracts to its portfolio of streaming contracts, including Capital Streams and Marketing Streams, and is pleased to have added a record number of new producers to its portfolio. During the quarter, Input's average upfront cost per tonne was $86.50 compared to $296.44 in the comparable quarter last year. For the first time, the upfront payment per tonne reflects upfront payments made into Marketing Streams. For more information about Marketing Streams, refer to discussion on Marketing Streams beginning on page 10 in the accompanying Management's Discussion and Analysis. For the six months ended March 31, 2017, Input recorded gross capital deployment of $33.132 million (compared to $17.917 million in the same period last year) into 142 streaming contracts for the right to purchase just over 193,000 MT of canola over the life of the streaming contracts. Net deployment for accounting purposes was $19.265 million. The difference is attributable to $9.956 million in contracts which remained pending at the end of the quarter due to closing conditions not yet fulfilled, and to $3.911 million in contract restructuring. During the six months, Input added 69 new contracts; 48 in Saskatchewan, 20 in Alberta and 1 in Manitoba. The remaining contracts were renewals, expansions and of existing contracts. During the comparable six month period ended March 31, 2016, Input added 19 new producers to its portfolio. During the six month period, Input's average upfront cost per tonne was $98.20 compared to $300.91 in the comparable period last year. For the first time, the upfront payment per tonne reflects upfront payments made into Marketing Streams. For more information about Marketing Streams, refer to discussion on Marketing Streams beginning on page 10 in the accompanying Management's Discussion and Analysis. As of March 31, 2017, Input's active streaming portfolio consisted of 179 geographically diversified streams. 134 of the Company's canola streams are with farms in Saskatchewan, 38 are located in Alberta, and 7 are in Manitoba. The Company is pleased with its continued growth across Alberta and Saskatchewan and expects to continue diversifying its asset base across the Prairies as it adds new streams to its portfolio. Seeding is underway across western Canada, accompanied by some late harvest activities in a few areas. While busy farmers generally means slower activity for Input, the Company has continued to complete numerous new streaming contracts in recent days. Management expects that Marketing Streams will be easily saleable year-round, leading to greater activity in the summer months than previously experienced in other years. So far, the Company is on track with its goal of doubling deployment from last year to this year, but it will not be known whether the Company's deployment goals for the year have been met until the fiscal year ends in September. This is also the time of year when Input is busy organizing and pricing canola for sale from the next harvest. Strong spring pricing is helpful in this regard, and news reports of anticipated canola shortages over the summer appear to be supporting the market. Farmers have announced intentions to grow a record number of canola acres this year – whether this occurs is now primarily a function of weather cooperation, as seeding has gotten off to a slower start than normal. Any shortfall in anticipated acres could lead to strong pricing right into the harvest period. 1 Non-IFRS financial measures with no standardized meaning under IFRS. For further information and a detailed reconciliation, refer to "Non-IFRS Measures" in the accompanying MD&A. 2 Includes contracts that were signed but not completely funded at the end of the quarter ended March 31, 2017 and is net of contract buy backs.